GURPS Compendium I collects in one volume all the new rules that have been added to the GURPS character creation system since the GURPS Basic Set, 3rd Edition was released in 1988. 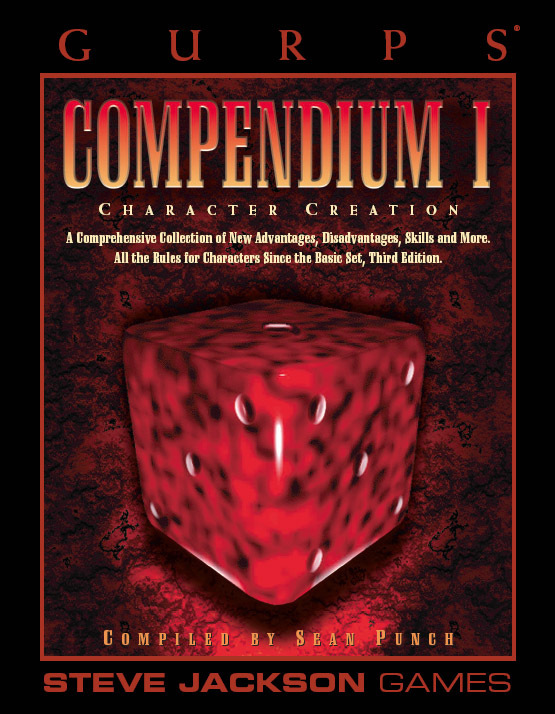 Compendium I contains hundreds of advantages, disadvantages and skills and other rules for character creation, all in one place! Compendium I contains a complete collection of character creation rules from previous GURPS releases and in Roleplayer, the GURPS newsletter. Since many older books are out of print, GURPS Compendium I is now the only source for this information. 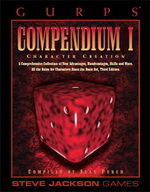 At 192 pages and with convenient lie-flat binding, every GURPS GM and player will want GURPS Compendium I: Character Creation. GURPS Character Builder – The official character creation utility for GURPS Third Edition. GURPS Compendium II – Third Edition expanded rules for character combat, injury and illness, mass combat, spaceship combat, and much, much, more!